Windows Mobile powered some of the first smartphones, but it’s about to go the Palm OS way – extinct. 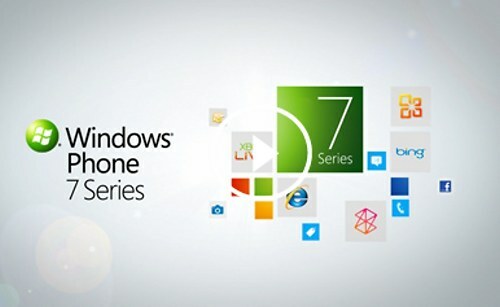 A complete overhaul was needed and after having the opportunity to watch several of the most influential OSes launch while they were busy thinking up Windows Phone, Microsoft settled on something that raises quite a few eyebrows. First off, there’s no backwards compatibility for apps – good riddance I say. Most apps use an interface that looked old even when Windows 95 was THE thing. Others flaunt smooth and shiny custom interfaces, but everyone has a different view on things so all apps end up looking differently. A usability mess if I’ve ever seen one. About the app store – there’s not much to tell yet. Windows Mo… um, Windows Phone 7 will use Windows Marketplace and there’s a chance that that will be the only source of applications. Well, it worked for Apple. The interface on Windows Mobile always looked like it was trying to imitate its PC counterpart for some reason. To feel more familiar to users maybe. But Windows Phone 7 comes with a brand new interface that looks nothing like the old one – and not quite like the other UIs we’ve seen so far, though there are inevitable similarities too. Everything centers on “hubs”. There are six of them – People, Pictures, Games, Music+Video, Marketplace, Office. These do a fair bit of social integration and pull content from photo sharing sites and so on, but nothing revolutionary so far. When it comes to multitasking though is when things start to get interesting. You’ve heard the rumors – “no multitasking” – and I have yet to see something to refute them. Was Microsoft asleep when Palm announced the WebOS? People couldn’t stop talking about how amazing the multitasking was. And the strongest criticism of the iPhone, besides “Steve Jobs is a control freak”, was the lack of proper multitasking. Two more hubs – but is it a fair trade for multitasking? Let’s not jump to conclusions though – Microsoft do make a good point, on a small screen you only use one app at a time, even if you have 20 running in the background. Here comes the true purpose of the hubs. Apps integrate into hubs and hubs both display information from the applications and control them – in a way you’ll be interacting with several apps at a time through the relevant hub. But these hubs sound very Android-like. Remember Live Folders – they aggregate information from apps. I haven’t written an Android review in a while, but last I did, they were terribly underused. That doesn’t bode well for hubs. One last bit – I’ve heard (though it hasn’t been confirmed) that Microsoft won’t let manufacturers to do any custom jobs (home-brewed new interfaces) on Windows Phone 7. Where does that leave the likes of HTC? HTC put so much effort into tweaking the interfaces of WinMo and Android with Sense, I can’t imagine they’ll just throw all their hard work away. But then, I can’t imagine them sticking to v6.5 either.